BH: Tell us a bit about yourself. Laurie Lynn: I grew up on a farm in Pennsylvania, surrounded by nature, craft, and music. My mom taught me to quilt, which started me off on my handmade lifestyle. Both my parents play music, which inspired me to play the flute and banjo (a recent addition), and together with my husband who plays the mandolin, we enjoy having bluegrass jams on the lawn with my folks when we visit. Spending time outdoors is a necessity for me, be it hiking, kayaking, mining for crystals, or just soaking it all in. My husband and I just moved to Concord, so we are thrilled to finally be living in the woods (coming from Boston, it is a huge change!). BH: How long have you been doing your artwork? Laurie Lynn: I started fabricating jewelry shortly after I moved to California in 2004, when I took a beginner’s metalsmithing class with a friend from the bead store where I worked. I immediately fell in love, and started accumulating the equipment I needed to work from home. When I moved to MA in 2008, I continued to dabble in metalsmithing as a hobby, until I heard about the North Bennet Street School. Straightaway I knew it was the place for me. I enrolled in their 18 month jewelry making program so I could learn the real foundations of jewelry making and make jewelry of the high quality I desired. Nine months after graduating from the program I left my office manager job to pursue my art and business (named Beryllina) full time. Laurie Lynn: I hand craft all of my jewelry using certified recycled silver, gold, and platinum, and stones that are mined in the United States, some of which I’ve mined myself. 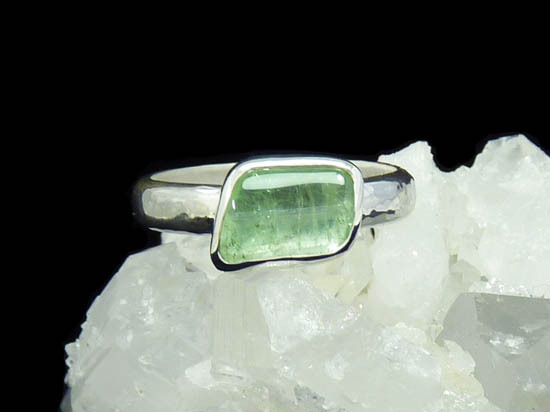 My jewelry is unique in style, and blends ancient traditional techniques with a more modern earth-inspired feel, often showcasing beautiful American gemstones or minerals. It is necessary to me to produce jewelry that I can feel good about, not just aesthetically and in terms of quality, but also morally and ethically, which is why I only use recycled precious metals and gemstones that were mined in the U.S.
BH: Why should people buy handmade? Laurie Lynn: It’s really important to buy handmade, not just to support artists, but to help encourage an economy built on intention, pride in craftsmanship, and American-made, high quality, durable, creative products. I think making purchases selectively and having fewer, but more inspiring, possessions, rather than many mass-produced items would be beneficial all around. BH: Where do you see yourself in ten years?